This fire gives you a quick, hot fire for boiling in pots and frying in pans. Build your foundation fire to resemble an Indian teepee. (Stand the tinder up in teepee fashion. Next stand pieces of kindling on end around the tinder – small ones first, then larger ones.) Pieces should overlap somewhat, and be touching. 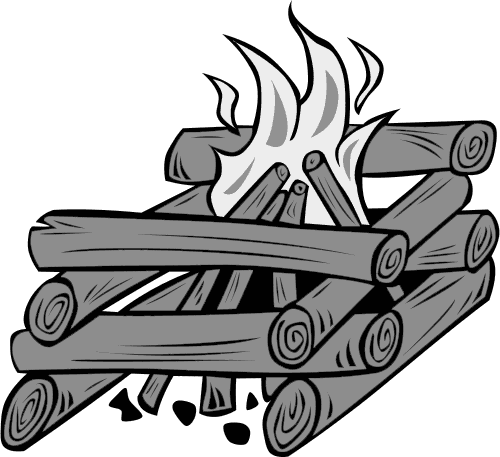 Once the kindling is burning good, begin adding fuel progressively using smaller to larger logs. Keep your fuel building tall, not widespread. Produces coals or a long-burning fire. It burns steadily, produces good coals, and does not need much feeding. Start with the Basic A fire and add wood in a criss-cross formation. Put thick sticks at bottom and smaller ones across the top. In this way, the wood will burn and fall, making a bed of coals. A log cabin is built by the same process, only open in the center. These fires are good for ceremonial or camp fires. When lots of coals are needed, arrange your firebricks to resemble a keyhole. Build your fire in a semi-circle and keep feeding it so flames are present. Rake coals into the lower part to cook on. Never even light your match without water nearby to put out a fire! And never leave a fire unattended! When asking girls to gather wood, be specific about what sized and quantity you want them to gather. Before getting started, tie longhair back and remove any clothing made of nylon. It all can catch fire so quickly! 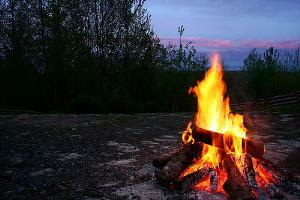 Only those tending or building the fire should be around the fire ring. Be sure not to pass things OVER the fire. Be sure to use the three sizes of wood. Tinder fires flame only shortly and are good for cooking nothing. Make your fire only the size you need it to cook your meal. Rotten wood, leaves, grass weeds and paper make lousy fire starters and don’t burn long enough to cook anything. Never use liquid fire starters. Check the area for overhanging branches, which may catch fire. On a windy day build a fire only where it can be sheltered from spreading. Remember that fires burn UP and fires need AIR. 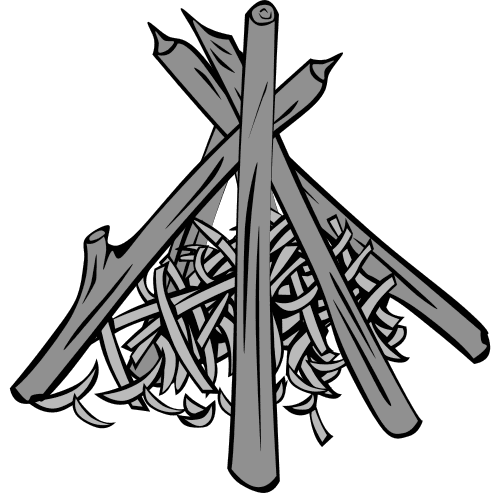 For example, a match to light a fire should be placed beneath the tinder or fire starter then to keep it going wood is places gently onto the flames pointing upward. Once a flame begins it will go out if smothered from air. It may be necessary to fan a fire to get it to ignite larger kindling or fuel. Brainstorm some safety ideas with your girls before getting started. Ask them about how to act and work around the fire. Always leave things nicer than when you found them! Having the ability to start a fire can make the difference between the life and death of a lost sportsman. Next time you go out in the field make sure you keep one of these homemade fire starters handy. This fire starter is easy to make and cost next to nothing, it has the extra benefit of being nearly waterproof. Simply place a small amount of Vaseline in a microwave safe dish and melt on medium heat only until it begins to run. Place 6-10 cotton balls in the melted Vaseline and saturate them completely. Allow the mixture to cool and place the cotton balls in a used film container. When you need to use them, take several cotton balls out of the film container and pull them apart. Place the Vaseline cotton ball fire starter under your tinder and light. The cotton ball acts like a wick for the Vaseline and will burn intensely for several minutes. This is another relatively cheap homemade fire starter. Gently heat some paraffin wax, available at your local supermarket or hardware store, in a coffee can. To do this place the can in water in a pot on the stove, over low heat, heat the water until the wax is melted. Remove the mix from the heat and slowly mix in sawdust until you have a mix of roughly 60% sawdust and 40% paraffin. Once the mix begins to cool you can carefully take small amounts and roll it into balls or whatever shapes you would like and allow it to cool. The paraffin and sawdust mix works in much the same manner as the vaseline and cotton ball fire starter, the wax melts and the sawdust acts like a wick, it is also fairly waterproof. Probably the easiest homemade fire starter is dryer lint. It burns hot and fast, needs only a spark to get it going and is lightweight. Take the lint from your dryer and place it in a film container, as long as it stays dry it will be ready when you need it.